Makes me wonder if his eye will pop up in different spots on his body. I still wonder why they chose the Yellow Devil in this. The background is clearly the 2nd Mega Man game's Wily Castle. Wouldn't it make sense to use the Mecha Dragon? Though it seems like they're kind of mixing it up with both MM1 and MM2 elements for this game. Yellow Devil and it's variants have been in 14 games (MM1, 3, 8, MM&B, SAR, Rockman World 5, Power Battles AND Fighters, 9, 10, X5, Zero, Zero 2). Mecha Dragon has been in 2 (MM2 and Power Figters). Three if you really want to stretch it and count the wrecked Mecha Dragon in Mega Man 8's opening stage. Seems pretty clear why they went with Yellow Devil. Does it really have to matter? Nintendo isn't going to get everything exactly right in Super Smash Bros, especially for a crossover game that focuses mainly on fighting. They'll add as many cameos as they can to appease everyone and to give more coverage to the represented games, but in order to do that they can't really sit there getting each and every little detail correct. Besides, previous SSB games had the apparent 'storyline' that all the fighters are actually toy figures being sent to fight each other for no real reason. Does it have to matter than that the Yellow Devil is in MM2's Wily Stage? Anyway, Smash Bros Brawl sold well despite its many flaws and has cameo characters like my favorite blue dude other than Mega, Sonic and Solid Snake and got good scores as well. So why are you complaing about this? It's good for capcom to have megaman in this game, so they didnt refuse it....And they need to time to make a true game now...a lot of time yet, but i try to be positive and to do the ridiculous fanboy who know only easy cristicism. Capcom can stop megaman games just because a lot of retarded fanboy are boring in the megaman community and will be never satisfed and will have never any respect for capcom...and i understand capcom! And only CAPCOM cared about Megaman, all the years with Inafune, now, they need new leaders for us. Capcom didnt do so much TV show for megaman games or others things it wasnt a lot. Megaman was always a serie for a fanbase, Capcom understood that. A good fanbase. They did a lot for us! Megaman games are not like Call of Duty or others games so much bought but anyways, Megaman is liked by Capcom. And remember, Capcom is a company, they need to survive. If you must blame, blame the company who try to dominate the videogame market without capcom and megaman....without violent games without soul. When i see the Xboxone and the PS4 war, so ridiculous, a lot say "nintendo" is dead. I hope no. Nintendo is the last company who make so great various games. But my first love is for capcom and megaman. Please no fighting when it comes to SSB, this is a glourious time for MM and it is true Nintendo does what Capcan't. All hail our Nintendo overlords! But yeah, nintendo did a great thing, i must agree with that, not sure if capcom cared about SSB because it's nintendo related. @July 1, 2013 at 6:43 PM: Correction Capcom does what Nintendon't. Which is you know, spread their risks across many IPs and come out with new things instead of milking the ever living crap out of nostalgia/and or casually excepted gimmicks. Capcom ain't got time to appease every little noise a small group makes. BTW if Capcom redesigned Mega just like this and released a game similar in vein with the classics with some extra touches to the gameplay and it turned out technically accurate, it still wouldn't sell, and people would still have their heads stuck too far up their nostalgic butts to even appreciate the effort. But The Big N(o) can get away with it, cause they still got the millions upon millions upon millions of Pikachu, Mario, and Link fans as well as the countless other Nintenerds that will eat up anything Big N(o) throws out to delude themselves into thinking they have anything other than dry generic casual content that offers little to nothing over the major/majority of competition other than a coat of superficial subjectivity. @July 1, 2013 at 9:01 PM Anon: Except unlike Nintendo, Capcom does not have to worry about supporting a home console and if a title does bad in sales on one console(See: resident evil revelations) it can port it to other consoles. And known names sell a console, not random games no one has heard of(Fact: Most gamers of the Gamecube/Wii/Xbox gen went PS2/Xbox, meaning the franchises that did poorly like F-Zero and Star Fox that were already barely were essentially sentenced to die since it meant small sales, in addition to newer IPs like Custom Robo, chibi robo and Wave race. Heck Pikmin 3s success is also in question because it had only been on the Gamecube). Also you might want to look at the 3DS eshop as well as Monolth Studio's X and the fact Nintendo is FUNDING Bayonetta 2 and published Ninja Gaiden 3 on the Wii U and they are starting to expand internal studios as well as Retro. The Gamecube and Wii saw several new IPs. They are starting to expand with small steps, especially since they realse this gen they are most likely going to be abondened. It's not something that's gonna happen in a month. And you dare accuse Nintendo of it when Capcom is so desperate to save RE that they ported a 3DS game to the home consoles because a main entry messed up so bad the portable game was the better one, that rebooted DMC to a mess that has divided the fanbase just like Megamans, that can't even acknowledge it's mascot in its big crossover game that should be FANSERVICE FIRST NOT FIGHTING MECHANICS(MVC3), that does DLC on disc(Almost everything last gen), does 'super' versions within a year of release, is opening Next Gen with a SEQUEL(Dead Rising 3), has been porting the ever living hell out of Megaman and RE to digital services, is remaking older titles, has several great franchises like Okami and Viewtiful Joe it sits on and does nothing with? They are nearly identical to Nintendo, if not worse than them. Open your eyes. @ July 1, 2013 at 9:01 PM lol u seem mad. why u so mad? As long as nintendo continues to produce great games they can "milk" their ips as long as possible, Capcom of today is nowhere near Nintendo FACT. Nintendo's games out class modern Capcom's games by leaps and bounds. Capcom has no talent left in the company (they drove most of them away with stupid desicisons and harrassing employees like Ono and that female who almost committed suicide), just big wig executives who think western reboots are the bees knees. Give up your trolling lol. July 1, 2013 at 10:46 PM: From past experiences rarely does a game redeem itself financially by going multiplatform, if it wasn't to begin with it usually will never be successfully. That said why would Capcom expand on the platform a game is able to be used on other than making petty cash on the side? Umm... to spread the appeal to a wider demographic might be one. Tell me what the hell is wrong with that? You and I can sit here all day twisting little details to conform to our behalf, but it will never change practical business ethics. During the Gamecube era, PS2 was outright dominating the video game market, making it the most successful video game machine ever made to date, this was due largely in part by its strong third party support. At the very same time Nintendo had a very successful handheld market to alleviate the pressure of the home console war, gaining major supporters and brands, which Nintendo clearly took priority over. This is why Nintendo has failed with the sixth gen home console war. Even then Nintendo recognized the appeal of third party supporters as well as new IPs to ignite ingenuity within the industry, and who was their primary supporter? Yep that's right Capcom! On top of this a large amount of Capcom staff as well as other big name developers supported the actual development of some big name Nintendo brands. All this resulted in a dry run financially, well yeah if critically acclaimed risky titles like Viewtiful Joe and Okami fail, the console developers can get their commission look the other way and move one to what could potentially be the next big hit, but where does that leave the publishers? At a bigger lose I'll tell you that. Capcom simply made the most practical business decision by porting its titles over for a larger audience, to stay alive after a big lose. Well no sh*t Nintendo is gonna support largely recognized successful developers and IPs if they have the means to do so. Come on man. Even though the success of the Wii itself was commendable, it sorely lacked the big name third party supporters and suffered because of it in the long run. Do you seriously think Nintendo wouldn't take advantage of that now that they have a more capable machine? We'll just see how long the support for Bayonetta and Ninja Gaiden lasts when the market decides it wants to go with "the more powerful machines" down the line. Also Capcom shares<keyword their risks across different IPs that doesn't mean they completely abandon an already successful franchise. For every Dead Rising 3 there's a Remember Me. BTW RE6 didn't bomb as bad as most might think. I suspect Capcom just had a lot to recoup from prior major loses like Asura's Wrath, and was betting it all on RE6. Also 10 new characters 35, new Ultras, new moves for the returning cast, balance changes, netcode adjustments, multiple free updates that are still being supported today doesn't warrant a sequel to a fighting game? To the contrary, "Super" Street Fighter 4 is one of the most expansive sequels in the genre this gen, and was released MORE than a solid full year after. What you're saying is the same as someone basically saying MMX2 is just a cheap cash in from the success of MMX, because they look the same and came out about a year apart. Nevermind looking at the game and judging it on its on merits like the new enemies, stages, sprites, music, bosses, weapons, level design textures etc etc Lets just look at the X sprite and the fact that the most generic parts of the gameplay are intact and commence judgement. As for Marvel no a video game crossover is not entirely about fan service, it has to be balanced out with other variables. Gameplay I would say is the most important aspect of game design regardless, and everything else should attribute around it. More than half the people crying for some characters to be in a fighting game wouldn't even play the damn thing. BTW Smash is not a fighting game, its a brawler in the vein of Power Stone 2, and even if it were a fighting game it would still have to be judged as it is. Mega Man fits Smash more than Marvel from a character design and gameplay perspective, plain and simple. All that said I know Capcom isn't any better than Nintendo or vice versa, they've both had/have high and low points. What I hate is people putting the "all mighty" Nintengod on the tallest pedestal ever imagined, for being able to do what others really shouldn't from a practical business standpoint. Lol at Kirby. XD Of course they just had to sneak him in there! That is a really nice picture! Makes me really excited for the game's release! I wonder, will Y.D. make players stick to it, (see Kirby) or will he take them and launch like The Power Fighters? (Kirby is ready to go) Either way, his role will be devilish! 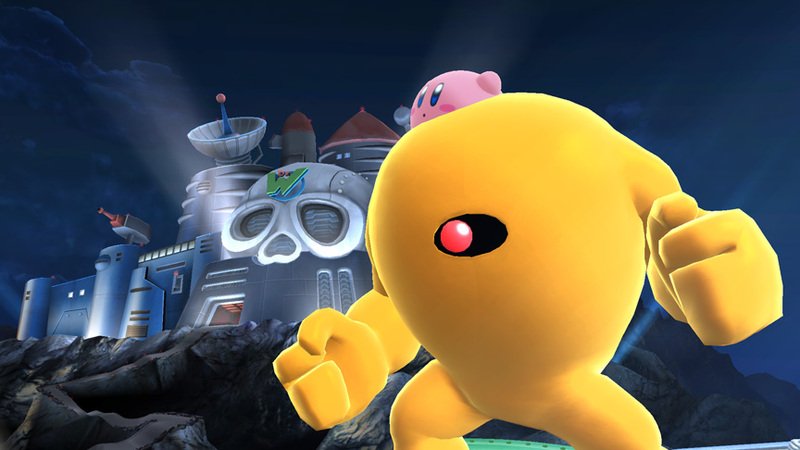 here's a crazy idea, what if yellow devil is/part of megaman final smash?